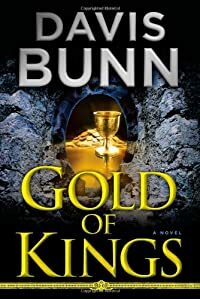 Gold of Kings by Davis Bunn, a Mysterious Review. Review: Author Davis Bunn's sterling reputation precedes him. With more than six million copies of his several books in print in sixteen languages, he's won three Christy Awards for the excellence of his work. His books are characterized by attention to detail, strong plots, meticulous research, and mesmerising entertainment. Now, with its blend of action, international settings, mystery, history, romance, and "six murders in four countries," Gold of Kings is cut from the same top-quality cloth, and is a highly-recommended read. When 25-year-old Storm Tyrrell is fired from her curator's job at Tyrells by her beloved grandfather Sean, the art and antique company's founder, she is devastated. And when her elderly but healthy relative suddenly dies of an unexpected heart attack, she is beside herself with grief for him and concern for the future of the firm. What the reader knows and Storm is led to find out is that Sean has fired her to protect her from the enemy who has silently poisoned him with "a quiet hiss, accompanied by a puff of air on his cheek." Sean has provided added protection for her by arranging to have his long-time friend and jailed treasure hunter, 39-year-old Harry Bennett released from a Barbados prison. Harry, the rogue with a heart of gold and a lost treasure to match, is to become Storm's bodyguard during a quest that Sean had secretly laid out earlier for finding a cache of Mid-East wealth known as the Second Temple treasure. Sean has left the itinerary and the clues for Harry and Storm to follow. They are soon joined on their trek by Emma Webb, a 35-year-old federal agent with ties to various departments and Interpol, and an asp-like "little tan man" with the substance of a sylph who keeps turning up as corpses turn over. Complicating the lives of the Storm-Harry-Emma trio are the agents and officials who work at cross purposes against them, except for Emma's Interpol boss who helps out at all the right places. Then, there's an international criminal intent on turning the art and antiques world into his private domain for forgery, money-laundering and ponzi-scheme inflation. Even Storm's aunt and her Dad turn up to get their fair share of finger pointing as possible suspects in the piece. An action-thriller that rockets ahead in high gear, Bunn's story involves a range of activities from car chases to mountain-top rappelling to jet skiing to a jail break with a huge dump-truck that "drove like a well-padded tank." In between there's an abundance of interesting historical bits, everything from how assassins got their name to the site of the "museum for the oldest boat ever recovered," to the 1600-year-old "most famous church in Cyprus," the country where most of the treasure hunt occurs amid the military and political tensions between the north and the south. There's plenty of tension, too, when Emma has to confront her boss and subsequently the entire FBI while simultaneously working for Interpol and helping to expose a worldwide art scam. And as the action rages around them, she and Harry steal the occasional moments of romantic bliss before the novel reaches its crashing conclusion with knives flashing, guns firing and bodies flying everywhere. Perfectly paced, the novel races when it should and slows down to smell the roses as needed or in this case, "the odors of roasting lamb and diesel and charcoal and mountains of spices and baking bread." Other images are equally striking such as the one of the ferry, "an ancient vessel whose ulcerous wounds wept rust." And characters can be summed up in a New York minute as "an angry stump of a woman," an amateur pianist who "did not play the keys so much as box with the music," or "a skinny black gnome" of an elderly lawyer "with hands "wrapped in skin like burnt parchment." Even "the rain pelting Seventh Avenue tasted of diesel and big city friction." And there are plenty more where those came from in Davis Bunn's excellent adventure, Gold of Kings. Special thanks to M. Wayne Cunningham (mw_cunningham@telus.net) for contributing his review of Gold of Kings. Acknowledgment: Simon & Schuster provided an ARC of Gold of Kings for this review.